They come in all shapes and sizes, however growing pumpkins is pretty much the same. 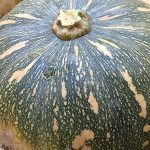 The same tips and tricks apply to all varieties, if it is a Butternut pumpkin or a Kent or a Queensland Blue you can grow it at home. 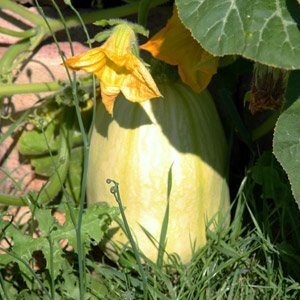 They are so easy to grow, in fact pumpkins will be found growing from compost piles, self seeded and happy in many Australian backyards. So if you have a sunny position and a fertile soil why not give them a go, you can even try them on a trellis, however you will need to support the fruit. Maybe try the giant pumpkins if you wish, not the best tasting but certainly a challenge and a lot of fun. Pumpkins are grown for their fruit and are excellent in the home garden, you can collect and save the seed from any pumpkin for planting the next season. The Potimarron and Turk’s Turban are two we like to grow, along with the butternut (pictured right) although we are looking at Kakai as well for next year. All you need is space and well drained humus rich soil. A minimum of 6 hours direct sunlight. Pumpkin seeds can be planted directly at around 5cm deep and should germinate in around 1 – 2 weeks as long as the soil is warm enough. They need a soil temperature of around 18C to germinate, so some gardeners do like to plant seeds in a greenhouse to give them an early start. 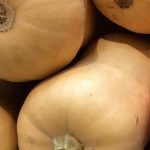 Good air circulation is the key to growing pumpkins. This helps prevent problems such as powdery mildew, it is best to water the soil, rather than the foliage to prevent fungal diseases. Flower drop is usually the male flowers that appear a little early, sending out signs to the bees that the crop is ready for pollination. Try to keep relatively weed free as this also promotes good air circulation. They are usually planted around the end of winter in temperate to cool climates, say October. Pumpkins do like warm weather, the warmer the summer the riper the pumpkin will be. The riper they are the better they will store. 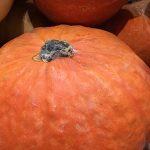 Pumpkins are heavy feeders, try seaweed extract or similar, a slow release fertilizer is also great. When applying the pellet or granular fertilizer it is best to dig this through the soil before planting, a few weeks before is best. Pumpkins vines can grow to 10m and more, but don’t be afraid to trim them back and even more the tendrils around to suit your needs. Yes pumpkins can be trained to grow up onto a roof, or even on a fence, you may need to build a sling to support the fruit as if grows. Pumpkins are thirsty, so keep up the water. As pumpkins have shallow root systems you need to monitor water carefully. In cooler weather they many not require water at all. However as summer heat sets in you will need to water. It is best to water without allowing the foliage to stay wet over night. So water in the mornings, or early afternoon. This helps prevent fungal problems and mildew. So gardeners set out a weeper hose and find that this is an excellent way to water. As pumpkins tend to grow fairly vigorously, once you start to get fruit setting you can trim the leaders of the long vines to contain them and encourage larger fruit. Knowing when to harvest pumpkins is no great mystery, firstly the skin should be hard, secondly the stem leading to the vine should be hard as well, this indicates that the pumpkin is no longer taking in nutrients. And Thirdly when given a tap it should sound a little hollow. SO how long from planting to harvest 3 – 4 months. When you do harvest them make sure you leave a good amount of stem attached, this helps them last longer and prevents rot. Many growers like to leave them in the field until the first frost hits as this will knock back the vines but also toughen the pumpkin and some say make it taste sweeter and keep longer. After this pumpkins need to be stored in a cool dry position for a final harden up. Before you store them check to make sure they are intact, no damage to the stem. Good air circulation is the key to long lasting pumpkins. Bees are the natural pollinators, you can help them by hand pollinating using your finger or a small paintbr ush. Pumpkins have male flowers and female flowers, the female flowers will have a bulge beneath the flower, the male flowers will have a single headed stamen in the centre, the female flower will have a stigma with multiple heads. So just use the paintbrush or your finger to transfer pollen from the male flower to the female flower. Potimarron is a popular French pumpkin . Small, teardrop-shaped fruit, great colour in the red skin and an aromatic flesh that has a chestnut flavour. A great pumpkin for roasting. Turk’s Turban is also great roasted (and it stores well) it is also a great looking pumpkin, not your traditional look, but like a ‘Turks Turban’. Of course the popular JAP, Queensland Blue, Butternut, Kent and Golden Nugget are all suitable to home growing. And if you are growing a JAP pumpkin, what is it ? Its a hybrid usually between the popular Kent and something else, ‘Just A Pumpkin’. It is so easy to do and cost nothing. Simply remove the seeds and wash the pulp off. Rinse well and lay out to dry. 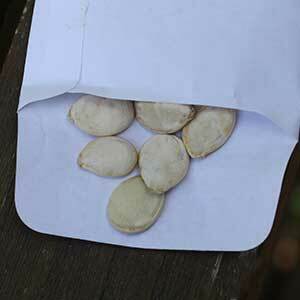 Once they are dry you can store them in a cool dry position in a jar or in a paper envelope. Try to use them the next year. Roasted, mashed, in a pumpkin pie or pumpkin soup. Pumpkins are also grown for the decorative fruit. Giant pumpkin competitions are held in many areas and in the USA pumpkins are an important part of the Halloween tradition. Pumpkins are great for roasting, or in pumpkin soup or pumpkin pie. They can also be used (roasted) in vegetable lasagne. We roast our pumpkins before we make the soup, or the pie or indeed anything, roasting seems to bring out a nutty flavour, at least we think so.